The deployment of technology across various phases of the dairy supply chain has been instrumental in realizing highest milk production by India along with huge profits. The adoption of technological tools, equipment and software, have had a remarkable impact on the production performance of the Indian dairy industry. It has not only digitized and automated the milk collection process but also left a momentum for continuous evolution. Having said that, the automatic milk collection system is one such example that has scaled the speed of operations and paved way for increased milk production with less per unit (of cattle) cost. However, this is not just one system that has enhanced the milk procurement process of the dairy industry. There are a few products that perform specific functions and collectively work to make up a solution to eradicate a number of problems persisting across the dairy supply chain. Let’s find out what are these innovative products and tools and how they impact the dairy industry. Fatomatic is an automatic milk Fat and SNF (Solid Non-Fat) testing machine that is used to analyze the quality of milk. The machine tests milk samples and measures Fat & SNF contained in milk based on milk type (cow/buffalo). The values obtained are used to calculate payment given to the farmers. Since Fatomatic is fully automatic, it eliminates any scope of human error occurring due to manual evaluations. Hence, the records cannot be modified, and farmers receive right payment for their milk. Milk Analyzer provides additional two features apart from having the functionalities as that of Fatomatic. The Milk Analyzer also measures milk density and water proportion present in the milk. Data Processing Unit (DPU) is a milk collection software that accepts data from the electronic weighing machine and Fatomatic/Milk Analyzer. Based on the data, it calculates milk bill, print milk slips & reports, and write processed data on Micro SD card. All the data that is received by the DPU is securely transferred to the Prompt Cloud through internet connectivity which can be accessed anytime, remotely. This facility makes it easy to restore data in case of loss or distortion. Farmer App is a modern and digital solution specially developed for farmers to let them manage their dairy business. The app displays milk Fat & SNF, quantity, passbook details, bank transactions summary, analytics & reports, etc. Since the accessibility to the data, the farmers can predict their payments, make a statistical comparison, monitor milk quality & quantity, and analyze daily milk trends. The move of making an app for farmers where they can view all their milk data has improved transparency between farmers and the milk unions. Milk Union App is built to manage the transparency between milk societies (VDCS) and dairy farmers. The data is maintained in one place with timely reminders to pay attention to each farmer. The milk unions can view live milk collection, cash balance, etc. at all the connected VDCS. Besides, they can see society-wise milk collection for selected day in a graphical representation for easy analysis. The milk union operators get real-time visibility into the union’s milk collection units/milk societies and farmers. The VDCS App gives milk societies an insight into daily milk collection, shift summary, total sales at the end of the day, analytical reports, farmer details, purchase reports, etc. The app has enabled VDCS operators to establish transparency between farmers and milk societies and eliminate the concept of intermediaries. 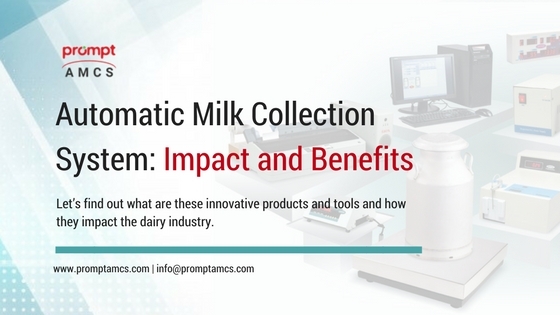 Do you think automatic milk collectionsystem or any of these products can benefit your dairy business too? If yes, check out all these products at https://www.promptdairytech.com/ and gain more profits.